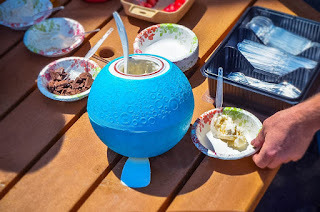 What do you think of this Kickball Ice Cream Ball? Whoever thought making a bowl of ice cream would be so much fun! Great for parties, barbecues, picnics, camping trips, etc. Just add your own ingredients - as basic or as fancy as you please. Then, add ice and rock salt to the business end, and shake and roll your way to your own delicious frozen concoction. BONUS QUESTION! Who has the best price? Today it is definitely the US Amazon site at 21% off!